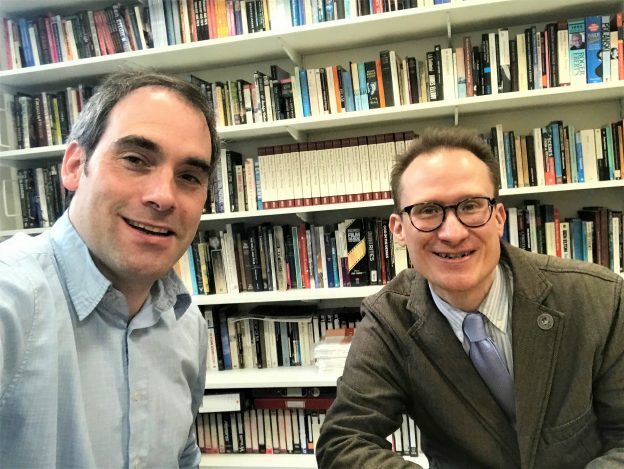 In the latest episode of the Nostalgia podcast series, Dr Chris Deacy, Reader in Theology and Religious Studies in the Department of Religious Studies, interviews Professor Mark Connelly from the School of History. Mark and Chris cover everything from reading Ladybird History books as a child; enjoying Neil Diamond’s ‘Sweet Caroline’; encountering Chesney Hawkes on a plane; having a soft spot for Romy & Michele’s High School Reunion; reading History at university; supporting West Ham Football Club and being a huge radio fan. Mark also talks about how he was the only pupil at his school to take O Level Religious Education. Chris’ next interview as part of this series, to be released on Friday 25 January, will be with the University’s Vice-Chancellor and President, Professor Karen Cox. Future interviewees include Clive Marsh (Head of the Vaughan Centre for Lifelong Learning at the University of Leicester), Dr Francis Stewart (teaches Religious Studies at Bishop Grosseteste University in Lincoln), Jeremy Scott (Senior Lecturer in English Language & Linguistics), Professor April McMahon (Deputy Vice-Chancellor, Education), and Professor Philippe De Wilde (Deputy Vice-Chancellor, Research & Innovation) Chris also speaks to one of SECL’s former students, Abi Hawkins, now Head of RE at Simon Langton Girls’ Grammar School in Canterbury.